Infections of the respiratory tract include those in the nose, throat and lungs. They can be caused by either a virus or bacteria. People with lower respiratory infections (bronchitis or pneumonia) are more likely to also exhibit symptoms of upper respiratory infections. The three causes of pneumonia include bacteria, viruses and fungi. A viral infection is typically less serious than a bacterial one. Pneumonia occurs when infectious organisms enter your lungs, either because you breathe them in, or they migrate from the nose and mouth. Another form, aspiration pneumonia, occurs when you inhale fluid from your mouth. Typically causes symptoms such as a mild fever, chills, body aches, a sore throat and enlarged lymph nodes in the neck. It may also produce a dry cough with only a small amount of mucus. Usually results in a high fever and a cough that produces thick mucus. You may also experience shortness of breath and extreme fatigue. Both types of pneumonia can cause chest discomfort. If you suspect you could have pneumonia, it’s important to visit an MD Now Urgent Care immediately. Pneumonia can be serious, so you’ll need diagnostic tests, usually a series of chest X-rays, to determine whether or not you have it, and if so, which type you have. Your doctor may also perform a pulse oximetry test to measure the amount of oxygen your blood is carrying and determine whether oxygen levels may be affected by pneumonia. Bacterial pneumonia is commonly treated with antibiotics. The type of antibiotics depends on the bacteria and the severity of the infection. If you don’t experience relief after a reasonable period, your doctors may change medications during the course of treatment to find the antibiotic that works best for you. Viral pneumonia is treated with different types of drugs, since it doesn’t respond to antibiotics. Most of these medications treat only the symptoms and not the cause, leaving your body to fight the virus on its own. In some cases, those with viral pneumonia may have an underlying bacterial infection, which calls for treatment with antibiotics as well. 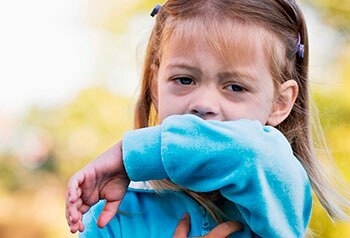 Pneumonia can lead to complications if left untreated, particularly in children and the elderly, or those with compromised immune systems or chronic health conditions. Pleurisy, inflammation of the lining between the lungs and ribs, is a common complication in cases of pneumonia. Pleurisy can cause fluid to accumulate, leading to a build up of bacteria, in which case a hospital stay may be necessary. If you experience a persistent cough, fatigue, chest discomfort and difficulty breathing, you may have a case of bronchitis. The cough typically starts out dry and develops into one that produces yellow or green mucus. A mild fever may also be present. Determining whether you have pneumonia or bronchitis can come down to listening for hoarseness and whistling noises when breathing. Those with bronchitis typically experience both symptoms, while those with pneumonia do not. Our doctors will run diagnostic tests to confirm whether or not you have bronchitis before prescribing treatment. 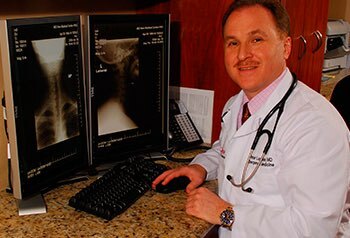 A diagnosis is usually confirmed with a series of chest X-rays. Treatment of bronchitis can be problematic as there are currently no effective treatments. 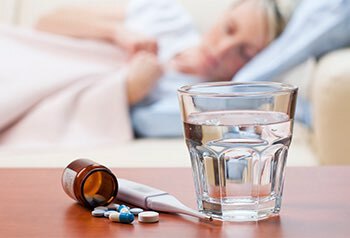 Your MD Now doctor will most likely recommend rest, drinking lots of fluids and taking over-the-counter medications such as acetaminophen to reduce fever, if needed. Cough medications may also be prescribed to facilitate breathing and relieve inflammation.